TRASH FIRE on Nichols Lane in Huntington Beach (HBFD photo). 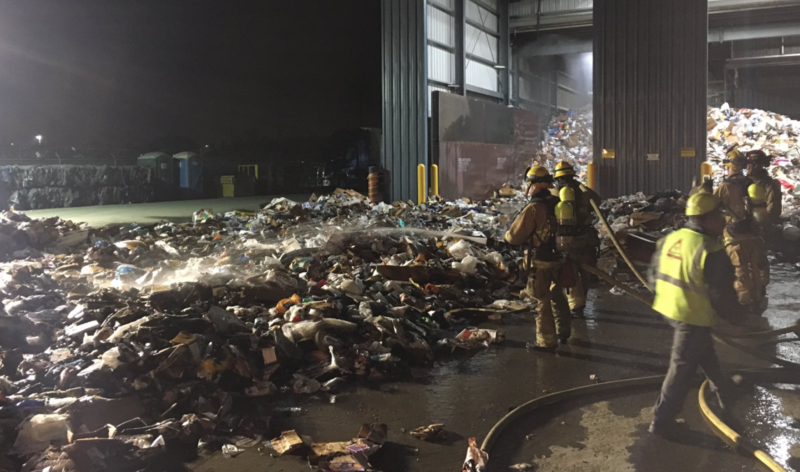 A large trash fire was battled by six firefighting units at the Republic Services trash and recycling center in Huntington Beach on Thursday evening. According to the HBFD, the fire was at the facility at 17121 Nichols Lane (near Warner Avenue and Beach Boulevard). It took about one hour to extinguish the blaze and do mop-up. No one was injured. The site has been the subject of some controversy as it is located across the street from Oak View Elementary School, and the Ocean View School District has complained about noise, odor and dust from the facility. Republic Services – also known as Rainbow Disposal – has promised to enclose the facility, but work on that project has not been completed.